The city has an incredible array of cultural offerings given its size, both temporary and permanent, long-standing and new, formal and informal. It is exceptional for the city’s size, in terms of both the quality of content and their outreach (and where appropriate, design and build quality). Its year-round festival calendar combines the best of international culture and local tradition, open to all regardless of age, allegiance, nationality, mobility, etc. How the city balances the management and delivery of this calendar would in itself be an interesting case study. The San Telmo and Tabakalera are two particularly good permanent spaces which would be worthy of further investigation. The city’s globally-renowned gastronomic standing is another aspect of culture, with facilities such as the International Basque Culinary Centre pushing the boundaries for economic differentiation. In addition, the city’s forthcoming status as European Capital of Culture 2016 provides many aspects for learning, including use of culture as a tool for overcoming violence and promoting peaceful coexistence in post-conflict societies; in citizen engagement (with the programme being entirely derived from ideas from residents and local cultural organisations); and participation in shaping and delivering major cultural programmes. The city has, and is, investing in the provision of high quality public assets, and has for many years been actively using these to enhance their inherited natural assets and to improve well-being and quality of life. The quality of public realm and green spaces, children and older-age facilities and intelligent re-use of buildings (e.g. Tabalakera) and its cleanliness / functionality is amongst the highest seen to date in European cities. How they have managed to achieve and sustain this in a period of financial challenge, along with the associated quality of life metric benefits, would be a great learning topic for the Academy and its networks. 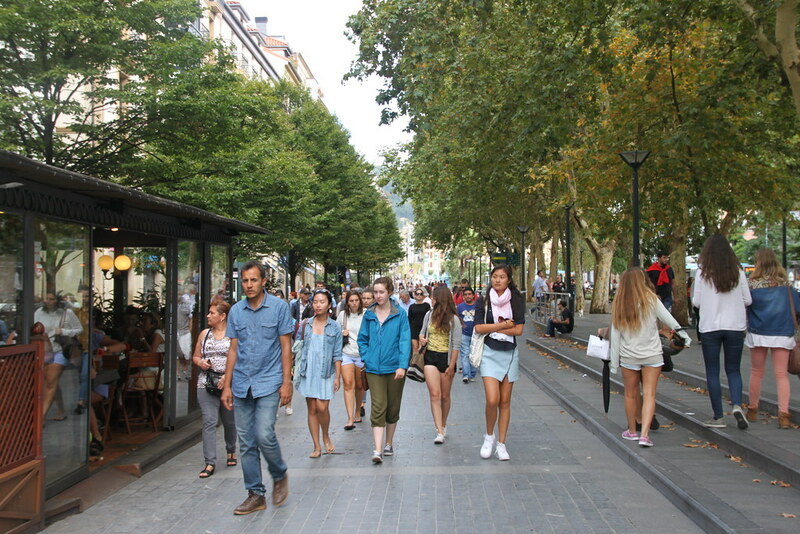 San Sebastián is very explicit in its objectives to reduce inequalities at all levels – not just in terms of income, but also in terms of mobility, employment, housing, access to social care, health and leisure, etc. It is promoting some interesting strategies and measures to ensure social inclusion and equality, including its Age-Friendly City programmes, ‘Social Centre’ networks, entrepreneurship and area-based regeneration programmes. San Sebastián has a long tradition of partnership working, with the responsibility and delivery for services being led by a range of public, public-private and private agencies. This includes between public agencies, with the private sector and with Higher Education institutions, for a range of purposes including inclusion, economic resilience and growth. How this is managed and coordinated, again in an era of financial constraints, would be an excellent learning topic. The city portrays an exemplary approach to city government, which is transparent, inclusive and open to new ideas. The Basque region has more autonomy than many other Spanish regions, and so the city has more direct control over areas such as education. The municipality is also not afraid to broach sensitive challenges, as exemplified in the thematic choice for European Capital of Culture. The high degree of participation in external networks, and being outward-looking and open to absorbing ideas and influences is very refreshing, as is the palpable influence this has upon city policy and delivery. San Sebastián (or ‘Donostia’, as the city is known locally) is the capital of the Gipuzkoa province of the Basque region in Northern Spain. It faces the Cantabrian Sea of the Bay of Biscay, and is 20km from the border with France. Its population in 2015 was just over 186,000, with a wider metropolitan population of almost 500,000. The city sits in a stunning natural amphitheatre, fronting 6km of pristine golden coastline at the mouth of the river Urumea, truncated by high promontories and inland by the foothills of the Pyrenees. It was a fishing village until 1174, when it was granted self-governing status by the Kingdom of Navarra for whom it was strategically important for exports to Europe, and later the Americas. The city’s topography historically made it an ideal strategic base, and by mediaeval times it had city walls around Parte Viejo (‘old quarter’) plus a castle on Monte Urgul overlooking the city and its bays. It was subject to several wars and sieges, the most significant in 1813 by Anglo-Portuguese troops which destroyed the city and its population. Mercantile activities gradually rebuilt the city physically and economically. Expansionary pressures saw the remaining city walls largely demolished to allow expansion on a grid plan by Ensanche Cortazar. The reconstructed, yet modernised, Parte Viejo now seamlessly blends into newer spacious Belle Époque neighbourhoods, with elegant Haussmann-style boulevards and Art Nouveau buildings. The man-made urban fabric weaves into the city’s topography, and gives it a series of distinct, beautiful yet interconnected neighbourhoods. San Sebastián’s establishment as a high quality tourist destination was cemented in 1885 by the Spanish royal family who made it their summer residence, in recognition of its beauty, quality of life and pleasantly moderate summer heat. They were also attracted by its long-standing liberal and cosmopolitan outlook. Its long history as a cosmopolitan trading port has imbued the city with a unique vibrancy and a sociable, equable culture. It is a very liveable city, teeming with life all year around, with a cultural offer which far outstrips its size and status. Not only does it offer a myriad of cultural assets, facilities and events; its high-quality, pedestrian-priority public spaces facilitates people of all ages, backgrounds and mobilities to mingle formally, and informally, respectfully together – chatting, playing, cycling, eating, rollerblading or simply sitting and taking it all in. It was also by far the most family-friendly city the assessment team had visited this year, with excellent and well-used children’s play facilities on many corners, both in the centre and in the suburbs, and children participating in seemingly everything that adults did. Tradition is cherished in San Sebastián, but in a unique way. ‘Donostiarismo’ embraces food and gastronomy, theatre, dance, spoken word/song improvisation (‘bertsolaritza’), boat-racing and sport – as energetically celebrated by festivals such as January’s Tamborrada, where all ages dress up, drum, eat and party in the streets for 24 hours; August’s Aste Nagusia (‘Big Week’), with its fireworks and ‘gigantes y cabezudos’ (giants and big heads); and September’s frenetic Euskal Astea week, ending with the Kontxako Bandera boat race in La Concha bay which attracts teams from all over Northern Spain. Over 100 languages are spoken in the city, including the highest proportion of Euskera, the unique Basque language. But as a society it is also open to change, both interacting with and absorbing other cultures. The city’s world-renowned gastronomy embodies this blending of traditional with modern, as well as its conviviality. The tradition of ‘pinxtos’ – exquisitely crafted and tasty tapas made with local ingredients, accompanied by local drinks such as Txakoli (young white wine) and cider – is highly sociable, being eaten by hopping from bar to bar. The fact that the city is often referred to as ‘food capital of Europe or the world’ (it has 16 Michelin stars, the highest per-resident in the world) and has the first degree-awarding International Culinary Centre, attracting students from all over the world. More recent history has had a strong influence on the San Sebastián of today, physically, economically and culturally. Untouched by the First World War, its liberal, cultural air attracted the crème de la crème of international high society, including Trotsky, Ravel, Mata Hari and others. However, the Spanish Civil War and subsequent Franco era was brutal: poverty, famine and emigration were common, with smuggling replacing legitimate commerce and industry, as well as severe repression of Basque culture – which many argue fuelled the Basque separatist movement and formation of ETA. Franco soon realised the loss of economic potential of the city, and so investment recommenced, including the technologically-astounding canalisation of the meandering river Urumea in the 1940s. In 1953, businessmen from the city were permitted to organise the first ‘International Film Festival’ to stimulate the economy and profile of the city – signalling a gradual relaxation of Fascist cultural restrictions. Industrialisation drove improved economic fortunes in the 1960s. This brought significant immigration from other parts of Spain and quick, dense and often high-rise urban development around former villages on the outskirts of the city in areas such as Altza and Intxaurrondo – often in sharp contrast to the indigenous built or cultural form. The subsequent socio-political and cultural contradictions and inequities meant the 1970s and 1980s saw general urban and social decay marked by social and political unrest, including the rise of ETA activity. The city has since worked hard over the past 20 years to reverse the consequences of this era, both physical and socio-economic. At the same time the Basque region has been given greater autonomy than many other Spanish regions, including over education, healthcare and welfare. The municipality has been determined to use this autonomy transparently and accountably to improve quality of life for its citizens, and to restore faith in democracy and authority which was so damaged during the Franco era, and again during the height of ETA activity. This renaissance in governance has been aided by changes in law which gave the municipality tax-raising powers and the ability to invest in new infrastructure (e.g. roads and public realm). The formal ETA ceasefire in 2011 was a further catalyst for this progressive dynamic. Consequentially there has been considerable investment in the city’s urban fabric, including renovation of key neoclassical and modernist buildings; construction of landmark buildings (e.g. Kursaal Forum and International Basque Culinary Centre); extensive pedestrianisation and green space and public realm expansion (eg. Zurriola beach promenade); and development of 140km of dedicated cycle lanes, strategic underground ‘park and rides’, bus lanes and new public transport interchanges. Socio-economically, a robust hierarchy of city policies and strategies deal with both specific sectors and cross-cutting themes, including the ‘Age Friendly City’ (over 20% of its population is over 65 years old, and life expectancy is one of the highest in Europe). The population is highly educated, with almost 40% having tertiary education qualifications. There are four prestigious universities in the city hosting approximately 16,000 students, but the dispersed nature of facilities means that there are no imbalances in city life, with students being absorbed into the general populous without the creation of ‘student zones’ as often seen in many other European cities. Area-specific social inequalities are being tackled with specific initiatives such as the network of Social Centres, which offer free advice and access to a wide range of social, education employment, training and domestic support. San Sebastián has traditionally performed well economically, which, when compared to other Spanish cities, cushioned it from the full impact of post-2008 economic crisis. That said, there have been consequential increases in employment on certain sections of its inhabitants – notably older, lower-skilled citizens and the under-25s – which are being addressed by dedicated programmes, including retraining, up-skilling and promoting entrepreneurship. The historic economic base included mercantile activities and industrial manufacturing, and from the late-1800s tourism and leisure; but has recently shifted to professional services and knowledge-based sectors. As befits its progressive and open character, the city has a strong culture of partnership working. Organisations such as Fomento DSS and ADEGI support and provide strong leadership to local businesses in commercialisation of ideas, training and internationalisation, some focused on identified growth sectors like retail and fashion. The city’s universities have a strong tradition in technology and engineering, notably digital, medical and biosciences and materials science; energy and resource sustainability are another focus. There is extensive collaboration between the universities and private companies (e.g. Orona Foundation) on research and development, and cutting-edge business parks for new and spin-out businesses such as Ibaeta. Programmes extend to school-age children, with a particular focus on ‘learning by doing’. All stakeholders exude a highly tangible impression that they understand the whole being greater than the sum of the parts. The city was selected in 2011 from a highly competitive field of 15 Spanish cities to be European Capital of Culture in 2016. This was tacit recognition of its rich cultural offer, but also an endorsement of its bravery in choosing a theme that placed a spotlight on its very recent transition from open ETA conflict – possibly the most challenging, divisive, and in many respects anomalous chapter in its history – to peaceful coexistence. The strapline being used – ‘harnessing waves of human energy and culture to overcome violence’ – truly embodies the spirit of the city in learning from the past to create a better future. The path to date has not been without challenges, but the city has already moved an impressive distance towards this goal in the short time since the formal ceasefire – especially when compared with other post-conflict areas in Europe. A key move has been to shape the content of the programme entirely from ideas generated by residents and local cultural organisations – demonstrating ultimate transparency and citizen ownership. It is now on course to deliver a Capital of Culture year quite unlike any other before, with a varied and unique programme, which will provide a deep, long-lasting global civic legacy.